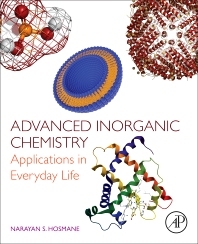 Advanced Inorganic Chemistry: Applications in Everyday Life connects key topics on the subject with actual experiences in nature and everyday life. Differing from other foundational texts with this emphasis on applications and examples, the text uniquely begins with a focus on the shapes (geometry) dictating intermolecular forces of attractions, leading to reactivity between molecules of different shapes. From this foundation, the text explores more advanced topics, such as: Ligands and Ligand Substitution Processes with an emphasis on Square-Planar Substitution and Octahedral Substitution Reactions in Inorganic Chemistry and Transition Metal Complexes, with a particular focus on Crystal-Field and Ligand-Field Theories, Electronic States and Spectra and Organometallic, Bioinorganic Compounds, including Carboranes and Metallacarboranes and their applications in Catalysis, Medicine and Pollution Control. Throughout the book, illustrative examples bring inorganic chemistry to life. For instance, biochemists and students will be interested in how coordination chemistry between the transition metals and the ligands has a direct correlation with cyanide or carbon monoxide poisoning (strong-field Cyanide or CO ligand versus weak-field Oxygen molecule). 1. Introduction: Why Do We Need to Know Quantum Theory? 1. Introduction: Why Do We Need to Know Molecular Geometries or Shapes of Molecules? 1. Introduction: Is It Necessary to Learn Molecular Symmetry? 1. Introduction: Is It Necessary to Learn Group Theory? 1. Introduction: Is It Necessary to Know About Ligands and Metal Complexes? 1. Introduction: Why Bonding Theories of Metal Complexes Are Important? 1. Introduction: What Makes Coordination Chemistry Interesting? 1. Introduction: Why Do We Need to Learn Electronic Spectra? 1. Introduction: What Is in Organometallic Chemistry? 1. Introduction: What Is so Special About Catalytic Processes in Our Daily Life? Narayan S. Hosmane was born in Gokarn, Karnatak state, Southern India, and is a B.S. and M.S. graduate of Karnatak University, India. He obtained a Ph.D. degree in Inorganic Chemistry in 1974 from the University of Edinburgh, Scotland, under the supervision of Professor Evelyn Ebsworth. After a brief postdoctoral research training in Professor Frank Glockling's laboratory at the Queen's University of Belfast, he joined the Lambeg Research Institute in Northern Ireland, and then moved to the USA to study carboranes and metallacarboranes. After a brief postdoctoral work with W.E. Hill and F.A. Johnson at Auburn University and then with Russell Grimes at the University of Virginia, in 1979 he joined the faculty at the Virginia Polytechnic Institute and State University where he received a Teaching Excellence Award in 1981. In 1982, he joined the faculty at the Southern Methodist University where he became Professor of Chemistry in 1989. In 1998, he moved to Northern Illinois University and is currently a Distinguished Faculty, Distinguished Research Professor and Inaugural Board of Trustees Professor. Dr. Hosmane is widely acknowledged to have an international reputation as “one of the world leaders in an interesting, important, and very active area of boron chemistry that is related to Cancer Research” and as “one of the most influential boron chemists practicing today.” Hosmane has received numerous international awards that include but are not limited to the Alexander von Humboldt Foundation’s Senior U.S. Scientist Award twice; the BUSA Award for Distinguished Achievements in Boron Science; the Pandit Jawaharlal Nehru Distinguished Chair of Chemistry at the University of Hyderabad, India; the Gauss Professorship of the Göttingen Academy of Sciences in Germany, Visiting Professor of the Chinese Academy of Sciences for International Senior Scientists; High-End Foreign Expert of SAFEA of China; and Foreign Member of the Russian Academy of Natural Sciences. He has published over 325 papers in leading scientific journals and an author of five books on Boron Science, Cancer Therapies, General Chemistry, Boron Chemistry in Organometallics, Catalysis, and Materials and Medicine.